Lewis Hey Sharp was born in Sydney. Following study at the University of Sydney, he was appointed lecturer in mechanical engineering at the University of Adelaide. After a period in England working for Westinghouse, he returned to Australia and eventually became acting professor of electrical engineering at the University of Sydney (1927−41). With a long-time interest in the mechanical aspects of photography, exposure to photography’s expressive possibilities came when he saw examples of pictorial work during his time in England (1912−13). He became a member of the Photographic Society of New South Wales and was active among the Sydney pictorialists from 1914 to the late 1920s. An 1858 review of a panorama of Sydney Harbour by O W Blackwood, praised the photograph: ‘Nothing dim or smoky appears … no muddled trees – no hazy outlines.’1 Within 40 years, many of the qualities which older photographers considered the result of technical imperfections – muddled trees and hazy outlines – were being deliberately sought. The bromoil process, used here, was a favoured way of achieving a soft, slightly blurred image. Captain Cattaleno introduced the process to Australia in 1910, making the first print in the rooms of the Photographic Society in Sydney. There were many variations, but the process usually involved making a large bromide print, which would be chemically bleached until a ghost image remained. When damp this would stand in low relief and repel and absorb the printer’s ink or oil paint in its highlights and shadows. 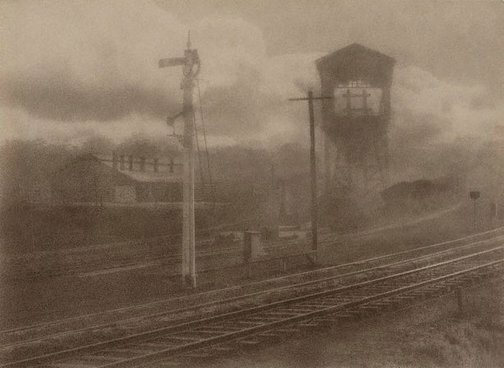 Steven Miller, Photography: Art Gallery of New South Wales Collection , 'Australian pictorialism', pg.71-91, Sydney, 2007, 84 (illus. ).